Manufacturers all have a common objective, to produce quality, functional components that satisfy industry demands. Industries such as electronics, medical, military, aerospace, R/F microwave, automobile, and communications all require precise thin metal components for some of their most common applications. The photo chemical etching process is one of the most cost-effective methods for high volume, burr-free, thin parts with low tolerances. Engineers work hard developing designs to meet industry demands and must do so quickly without compromising quality and functionality. It then becomes the role of the project manager or buyer to begin the search for the most reliable custom manufacturer supplier to make the designs a reality. The road from design→ prototype→ material selection→ manufacturing process→ finishing services→ testing, and finally to the consumer or organization is well thought out. To make this process easier, one must understand the qualities of a good photo chemical etching company and what to expect when it comes to experience, quality, and capabilities. “Experience is a truer guide than the words of others” – Leonardo Da Vinci. Is experience everything? Not necessarily. However, a company must be doing something right if they are still around. Most likely they have long-standing relationships with customers and suppliers. It is an even better sign if its employees have been around a long time as well because they are the backbone of any organization, and it is indicative of good company culture. Ask if the prospective company cross-trains their employees. If so, it is very likely they have a full scope and understanding of machining processes and a product life-cycle which can help avert any foreseen problems and increase efficiency in the production line. With time comes an extensive portfolio of the different product applications and requirements, and likewise, excellent customer service. A good photo chemical etching company with experience must keep up with new technologies. Consequently, a PCM (photochemical machining) manufacturer will invest in new equipment to increase capabilities, quality, and productivity. They are also more likely to be educated in metallurgy, and how it applies to product functionality and conductivity for which specific applications are dependent. From a financial perspective, a company with longevity understands how the fluctuating economy can affect manufacturing costs, and when necessary, will engage in price negotiations with suppliers to keep costs down for customers while maintaining efficient inventory control procedures to support stable operations. “Quality is king” certainly rings true in today’s manufacturing environment. With increasing industry regulations added on an ongoing basis, it is necessary for companies to accommodate these changes for improved processes, part functionality, and customer trust. Therefore, metal etching companies must invest in the most technologically advanced equipment and purchase quality materials from trusted suppliers. There are several compliance criteria to consider when photochemical machining companies purchase materials. RoHS (Restrictions of Hazardous Substances) compliance restricts the use of specific hazardous materials found in electrical and electronic products that can interfere with performance. DFARS (Defense Federal Acquisition Regulation Supplement) is a set of restrictions aimed to protect the US defense industry from risks associated with the dependency on foreign supply. Therefore, photo etching companies should comply with these regulations to protect the defense industry and industries that use electronic components. Another critical quality issue of equal importance to the defense industry is the ITAR ( International Traffic in Arms) compliance which requires manufacturers and suppliers of goods and services to register with the State Department’s DDTC (Directorate of Defense Trade Controls) to ensure products are within ITAR guidelines designed to protect U.S. national security. Choosing an American-made (US) manufacturer can guarantee and control the metal quality. The most universally important quality compliance that a good PCM manufacturer should have is an ISO (International Standard for Organization) compliance certificate. With this, OEM’s can be sure that photo etching companies adhere to a series of documents created to ensure materials, products, processes, and services comply with specific industry applications and purpose. Having the latest ISO standards proves that a PCM company continually reviews and updates their procedural and reporting methods to create manufacturing efficiency and accountability to customers. Also, state of the art production and inspection equipment to maintain burr-free parts with accurate dimensions and tight tolerances are important qualities of a good photo chemical etching company. “If the shoe fits, wear it”. The essential consideration is of course whether or not machines can etch a part’s dimensions. The thickness, tolerances and metal type of prospective customer’s part are deciding factors which photo etching supplier to choose. Start by visiting a company’s website to view machining capability data information. 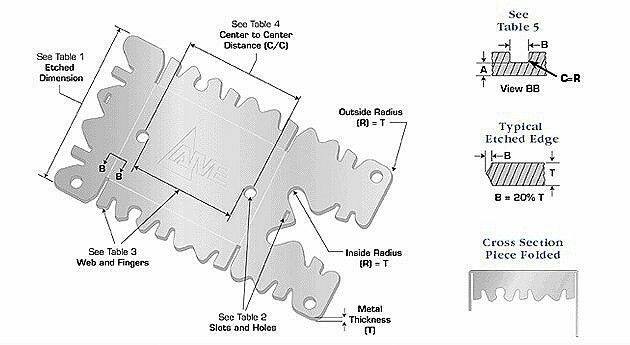 Here you will find technical details such as etched dimension tolerances, holes/slots diameter and width, center to center tolerances, and half-etch capabilities as well as the types of allowable metals. 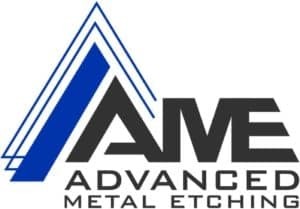 Source: Advanced Metal Etching, Inc.
Other qualities of a good photo chemical etching company are assisting with design problems as it relates to the part and offering solutions based on etching experience with many simple to complex industry product applications. The design engineer will utilize CAD software to determine how the etching process will affect the design and make changes to compensate for the lateral and vertical etching effects on the metal to create a spectrum of geometrical contours and retain tolerances. For example, the addition of tabs is sometimes necessary when a technical etch tolerance is required, or components need plating, electroplating or assembly. It is beneficial to inquire about a manufacturer’s experience with a particular industry component regarding volume and design best practices. “Time is money” – Benjamin Franklin. Ultimately, these two words define the goal of many businesses today operating in the fast-paced technology market. With this as a driving factor, how can a metal etching company help get a product from design to consumer quickly? Look for companies that offer fast quotes, quick turnaround times and practice lean manufacturing. Ask a chemical etching supplier how long it takes to receive a quote after all the part information is submitted. They should be able to respond within hours confirming the quote was received and then give an assurance that a quote will be delivered within 24 hours. Ongoing communication is the key to success. If a photochemical machining company has a formulated quoting sheet with pre-set conditions based on variables such as metal, temper, volume, finishing services, etc., then they will be able to turn around a large number of quotes in a short time. Another important time factor is the turnaround time of the part cycle from quoting to shipping. Most PCM companies’ standard lead times are within 2 weeks. Some companies offer expedited services, which may include 24 hours or less. This shorter time frame is especially important for prototypes that may require testing prior to full production. Moreover, in-house finishing services offered will reduce lead times. If a company does out-source services, being close to major industrial areas and long-standing relationships with out-sourced suppliers may prove to be just as beneficial. Lastly, another efficient time-saving process is the practice of lean manufacturing. Lately, there is much talk about lean manufacturing and how it affects performance. How does this look in the chemical etching environment? With the adoption of manufacturing software and scanning systems, a part’s cycle is tracked from sales order to production, then shipping. All paperwork is scanned and then can be viewed from computers in every department. Shop floor layouts are strategically planned, in-process quality audits conducted to prevent problems, and continuous improvement processes are in place. All of these time-saving actions will enhance customer service and accountability. Technological advances will require companies to invest their resources in order to keep up with industry demands. When the time comes to find a trusted supplier to align with your business goals, experience, quality, and capabilities are the benchmark qualities of a good photo chemical etching company. A reliable supply chain eliminates delays in the project management process and ensures a quality end product.